The Receiving, Inspection Test Facility (RITF) provides testing, evaluation services, and training to the aerospace community and outside industry. As a unique laboratory with a wide range of both electrical and mechanical testing, analysis, and training capabilities, the RITF is interested in developing new, collaborative partnerships. 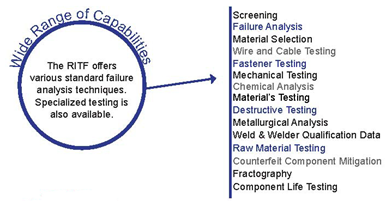 The facility specializes in failure mitigation through electrical/mechanical component screening and materials validations, and in failure analysis by conducting non-destructive and increasingly invasive techniques as needed to determine the cause/mechanism of failure. 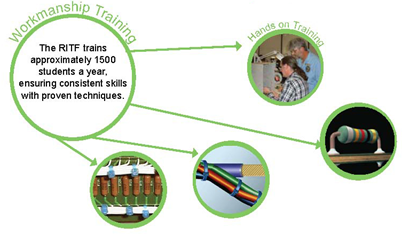 Other services include “hands-on” training to engineers, technicians, and inspectors in the areas of soldering, surface mount technology (SMT), crimping, conformal coating, fiber-optic terminations, and electrostatic discharge (ESD). Explore the RITF’s capabilities to see how a partnership with this accredited facility may benefit you. Click each of the three graphics below to learn more.